Former Minneapolis Fed president Narayana Kocherlakota thinks that the Fed's recent communication strategy has resulted in an unforced "credibility dilemma." (The Fed's Credibility Dilemma.) What is the nature of this dilemma? The message coming out of the Fed recently is one of "gradual normalization." 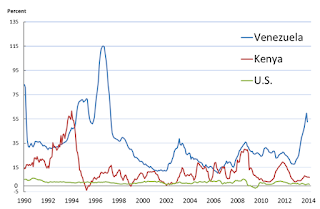 Normalization refers to returning to the state of affairs that prevailed prior to 2008, when the Fed's balance sheet was much smaller and the policy interest rate (short term nominal interest rate) was much higher. "Gradual normalization" means that the Fed's policy rate is likely to move slowly and in an upward direction over the indefinite future. But what "gradual normalization" means and how it is interpreted by market participants can be two different things. Kocherlakota is worried that the market is interpreting the phrase as meaning the Fed will raise its policy rate slowly and in an upward direction. While this may very well be the case, it should be clear that this is not what Fed officials mean to say. Consider, for example, this report on a recent speech delivered by Boston Fed president Eric Rosengreen. The future path of rates, he said, will depend on incoming economic data, and how that data affects policymakers’ outlook for the economy. This is a statement about state-contingent policy, together with a gratuitous forecast of the conditioning factors. These are two conceptually distinct objects that, when combined, give financial market participants the information they seem to crave: a statement about the likely path of interest rates over the foreseeable future. Kocherlakota's concern is that this type of communication is misinterpreted by market participants as a commitment to a deterministic policy path. I think he's correct that some (perhaps many) people do misinterpret in this manner. If so, then the Fed faces a "credibility dilemma" because, well, what happens if the conditioning factors turn out not exactly as forecast? If future inflation comes in high above target, then the Fed will be forced to raise rates sharply and prematurely--reneging on its "commitment" to raise slowly--thereby "losing credibility." Or, if the economy turns south, the Fed may be forced to lower its policy rate--again, reneging on its "commitment" and "losing credibility." The apparent dilemma is that commitment along some dimension must necessarily be sacrificed. So what, if any, plans should the Fed communicate? For one, officials must recognize that their expectations for the economy, like all forecasts, are likely to prove wrong. As a result, they should be much clearer about their willingness to make large and rapid changes in monetary policy. Instead of talking about gradual normalization, they should stress that they are ready to do “whatever it takes” to keep employment up and inflation near target. I mostly agree with this suggestion. The part I disagree with (slightly) is where he says "they should be much clearer about their willingness to make large and rapid changes in monetary policy." I think--although I could be wrong--that the public is already generally aware that the Fed will make large and rapid changes in monetary policy should economic conditions dictate. Look at how the Fed reacted in 2008. Ask yourself: if inflation was to spike up to 5% tomorrow, how do you think the Fed would react? We all know how the Fed would react! That is, I do not think that the issue Kocherlokota raises has anything to do with credibility. 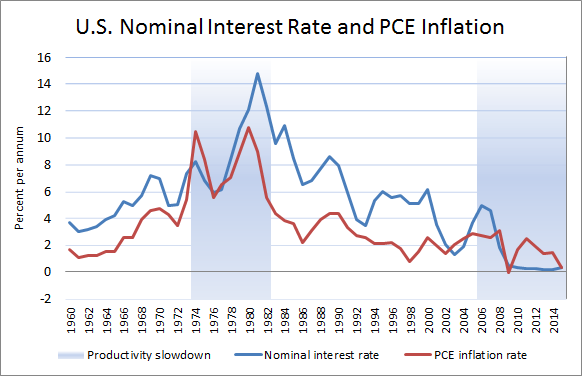 In 1971, the executive branch temporarily hampered the Fed's low-inflation credibility by abandoning the gold standard. [Take note, you End-the-Fed types--Fed chair Arthur Burns argued strongly against abandoning the gold standard.] But that reputation was won back (at a terrible price) by Paul Volcker in the early 1980s. Since that time, inflation has been relatively low and stable. Maybe it's not perfect, but it's an inflation record that many countries would envy. Consider this, for example. What about "forward guidance?" Yes, it works great in theory, if one assumes that a central bank can commit to take actions at future dates that are not in the best interest of the economy when that future time arrives (economists call this time-inconsistent policy). But let's just face it -- the reality is that commitment along this dimension does not likely exist. Does anyone really believe that the "commitment" made by FOMC voting members today will bind a future FOMCs comprised of completely different people with different points of view? Convince me otherwise. The Fed is credible where it matters most: its commitment to keep inflation low and stable, and to do whatever it can, within its legislated powers, to help the economy function in the best manner possible for the good of the country at large. Is it a perfect institution? No. Can policies be improved along various dimensions? Almost surely. We're all in this together. Let's try to figure it out. In the meantime, Kocherlakota is probably correct in suggesting that communications which imply (or are wrongly interpreted) as commitments that cannot possibly be met in most states of the world are not likely to be very useful. They may even prove counterproductive. But would taking an unexpected policy action necessarily whittle away at Fed credibility? I don't think so--not along the dimensions that matter. There is no credibility dilemma here. And it does little good to cast the issue in this light. Postscript. Friday, March 25, 2016. 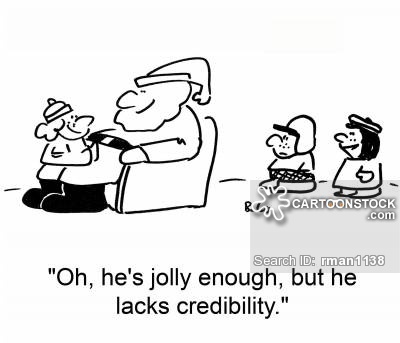 Tim Duy weighs in here claiming that there are two types of credibility (hard and soft) and that the Fed cares about both of them (when it should perhaps only care about one). I had the honor and pleasure of delivering the 30th Timlin lecture in economics at the University of Saskatchewan last Wednesday. My talk was on Secular Stagnation, a topic I think Timlin would have approved of. I enjoy giving public lectures. It's fun to connect economic theory to real world policy issues in a public forum. I think I often learn more from the interaction with the audience than they do. It was also an opportunity to learn more of Mabel Timlin and her remarkable story. Mabel Frances Timlin was born in Wisconsin in 1891. It's not clear what motivated to move to Saskatoon in her youth. 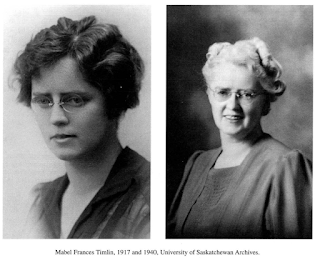 In 1921 she found employment as a secretary at the University of Saskatchewan. Evidently unimpressed with the papers she was typing for the economics faculty, she decided to study the subject in her spare time. She eventually completed her PhD at the University of Washington and become an assistant professor at the University of Saskatchewan in 1941, at the tender age of 50. She evidently transformed the Canadian macroeconomics profession in terms of its application of formal economic modeling. She became Canada's first female full professor of economics, the first woman to serve as president of the Canadian Political Science Association, the first woman outside the natural sciences elected a Fellow of the Royal Society of Canada, and one of the first ten women to serve on the executive committee of the American Economic Association. I include a piece below, sent to me by Robert Dimand, that provides a few more details of her career. I think it's quite an inspiring story. The Keynesian economist Mabel Timlin was the first tenured woman among Canadian economists, first woman elected president of the Canadian Political Science Association (which then covered all social sciences, including economics), the first woman outside the natural sciences elected a Fellow of the Royal Society of Canada (1951), and one of the first ten women to serve on the executive committee of the American Economic Association (1958-60), despite becoming an assistant professor only in her fiftieth year, after a long career as an academic secretary. She was born in Forest Junction, Wisconsin, on 6 December 1891, and, after studying at the Milwaukee State Normal School, taught in Wisconsin and rural Saskatchewan. She became a secretary at the University of Saskatchewan in 1921, while studying for a BA there. At first Timlin intended to study economics there, but after seeing the Department of Economics and Political Science she decided (probably correctly) that she could learn more economics on her own. She took a BA with great distinction in English in 1929, and then directed the university’s correspondence courses in economics. Mabel Timlin became an instructor in economics at the University of Saskatchewan in 1935, after completing graduate course work in economics at the University of Washington during summers and a six-month leave. Her doctoral dissertation at the University of Washington, supervised by the much younger Raymond Mikesell, was accepted in 1940 and published as Keynesian Economics (1942). In 1941, Timlin became an assistant professor of economics at the University of Saskatchewan (associate professor 1946, full professor 1950) and a member of the executive committee of the Canadian Political Science Association (vice-president 1953-55, president 1959-60). Keynesian Economics did more than introduce Keynesian theory into Canadian academic life. Timlin offered one of the early general equilibrium interpretations of John Maynard Keynes’s General Theory, and was particularly noteworthy in treating it as a system of shifting equilibrium, presented with innovative diagrams on which she collaborated with the eminent geometer H. S. M. Coxeter. Timlin began work on Keynesian Economics in 1935, before Keynes published his General Theory: Benjamin Higgins had come to Saskatoon from the London School of Economics in 1935 for a one-year appointment, carrying a copy of the summary of Keynes’s Cambridge lectures that Robert Bryce had presented in Friedrich Hayek’s LSE seminar. Beyond her work on Keynes, Timlin also expounded international developments in welfare economics and general equilibrium analysis to a Canadian audience more used to historical and institutional economics than to formal theory (e.g. Timlin 1946). Timlin (1953) sharply criticized the Bank of Canada for failing to follow Keynesian countercyclical stabilization policies during the Korean War inflation. Much of her later work (e.g. Timlin 1951, 1958, 1960) concerned immigration policy, emphasizing the economic benefits of freer immigration. Mabel Timlin never married. Generations of former students were her extended family. She remained active as a scholar long after her official retirement in 1959, publishing a major report on the social sciences in Canada in 1968. She remained devoted to the University of Saskatchewan despite job offers from such institutions as the University of Toronto, and died in Saskatoon on 19 September 1976. 1942. Keynesian Economics. Toronto: University of Toronto Press. and Political Science 12, 483-495. 1951. Does Canada Need More People? Toronto: Oxford University Press. Papers and Proceedings 43, 42-53. Post-Keynesian Economics, London: George Allen & Unwin, 59-88.
International Economic Association, International Migration, London: Macmillan. of Economics and Political Science 26, 517-532. 1968. The social sciences in Canada: Retrospect and prospect. In M. F. Timlin and A.
by L. Tarshis. Toronto: McClelland and Stewart, Carleton Library. men. Atlantis: A Women’s Studies Journal 23, 28-38. University of Saskatchewan, 1910-1960. Toronto: University of Toronto Press. The 1970s were tumultuous years. There was the Vietnam war, oil supply shocks, and Watergate. The anchovies had disappeared off the coast of Peru. Clothing styles ranged from dreadful to appalling. Disco music was in. It was an awful time for those of us who lived through it. The San Francisco Fed produces its own "utilization-adjusted TFP" series here. This is what what their measure of TFP looks like since 1960. The shaded episodes were constructed using my eyeball metric, but I think that most people are likely to identify similar regions. 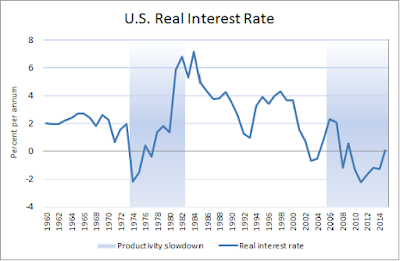 Economic theory suggests that the real rate of interest should (ceteris paribus) be low in a low-growth regime (and high in a high-growth regime). Let me compute a measure of the real rate of interest by taking the annual nominal yield on U.S. treasury debt and subtracting annual PCE inflation. Here is what the data looks like. Well, not a perfect fit (remember the ceteris paribus part) but close enough, I think, to be intriguing. In particular, note that both low-growth regimes identified above are associated with significantly negative real interest rates. The early 1980s look odd by this view but, of course, we know that this era was associated with another type of regime change. In particular, Fed policy moved from a high-inflation regime to a low-inflation regime, with this regime change occurring in 1980 under Fed chair Paul Volcker. 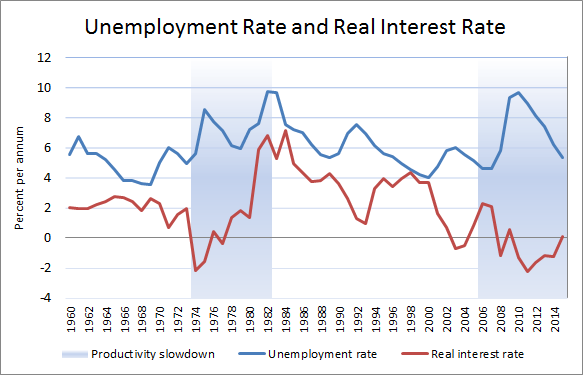 Here is how the unemployment rate correlates with the real interest rate and growth regime. Low-growth regimes beget low real interest rates and high unemployment rates. This seems consistent with Alvin Hansen's secular stagnation hypothesis (see my earlier post here). The pattern is evident in the most recent episode, as it is in the 1970s. Except nobody called it secular stagnation back then. The 1970s may not be viewed as an era of secular stagnation because nominal interest rates and inflation were rather elevated in that episode. Secular stagnation, with its Depression-era origin, is more naturally related with low nominal interest rates and low inflation. But as the following diagram shows, secular stagnation can occur in high-inflation regimes as well as low-inflation regimes. The 1970s episode was called stagflation (an era of high inflation and high unemployment). The two low-growth regimes above were different in an important way. When the economy transitions from a high to low-growth regime, the shock of regime change produces uncertainty. Investors will naturally move resources out of capital expenditure and into safer asset classes. 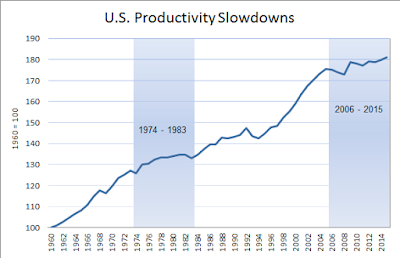 Here is a critical question: What are the safe asset classes when a productivity slowdown occurs? The answer to this question seems to vary across episodes. In the 1970s, the USD and UST securities were not among the set of safe assets. This was in large part due to the "unanchoring" of U.S. monetary policy following the breakdown of the Bretton Woods fixed exchange rate system. In August 1971, President Nixon announced that the USD would no longer be pegged to gold. More importantly than this, the public likely did not believe that monetary policy would keep inflation in check through other means (it took Volcker to convince the public of this several years later). The added fiscal pressures of the Vietnam war and the Great Society spending could not have helped this perception. 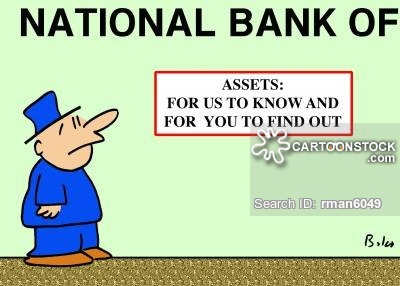 As a result, the safe assets back then did not include government securities. Instead, investors flocked to assets outside the direct control of government, like gold and real estate. In the most recent episode, real estate was most certainly not considered a safe asset. Investors began to walk away from real estate in 2006. They then ran way in 2008. Ironically, it was the USD and UST securities that proved to be among the most highly regarded assets this time around. This is no small part attributable to the fact that U.S. monetary and fiscal policies are presently perceived to be "anchored" (unsustainable paths for money and debt are viewed as temporary departures from a long-run stable anchor). It's worth thinking about just how large the worldwide demand for U.S. money/debt must have grown since 2008. We can infer this enhanced demand from two observations. First, the supply of debt was increased substantially. Second, the price of that debt went up, not down (safe bond yields generally declined). What might have happened had the Fed/Treasury not intervened in the way they did? To answer this latter question, we can look to the "hard money, tight fiscal" policy regimes in place when a low-growth regime hit the U.S. economy in 1929. In the early 1930s, short-term bond yields plummeted as today, and CPI inflation ran close to negative 10%. The unexpected and dramatic deflation--produced by an elevated demand for money against a fixed money supply--almost surely exacerbated the depth of the contraction through well-known channels. The lesson here is that responsible monetary and fiscal policy "anchors" a regime, rendering its money/debt a safe asset. But anchoring a policy regime does not require strict adherence to a fixed asset supply rule, like the gold standard, or year-over-year balanced budgets. A credible regime will permit the supply of safe assets to expand "elastically" when the demand for the product is enhanced. Doing so can help stabilize inflation around its expected value. Of course, it is important to let the elastic snap back should economic conditions dictate. The experience of the 1970s demonstrates what can happen when a policy regime becomes unanchored. The optimal conduct of monetary and fiscal policy over the longer term when a productivity slowdown hits is much less clear. Alvin Hansen expressed skepticism that expansionary monetary and fiscal policy could do much of anything beyond the initial shock period. If anything, it might even do some harm if, for example, such policies led to a very large public debt. Instead, Hansen favored what today we would label "pro-growth policies." His conclusions stemmed from the fact that he viewed growth slowdowns as the byproduct of slowing innovation and population growth--phenomena that monetary and fiscal policies are ill-equipped to deal with. The situation is slightly different today in that, unlike in Hansen's time, there is presently a huge worldwide demand for U.S. treasuries. This demand stems from three major sources. 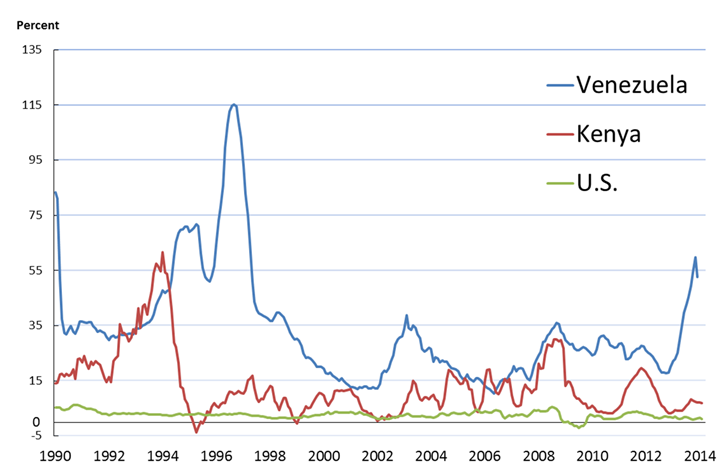 First, the UST is used widely in the shadow banking sector (in repo and credit derivatives markets) as collateral, a sector that has grown significantly since the 1980s. Second, many emerging market economies want to hold USTs as a safe store of value. And third, there has recently been an added regulatory demand for USTs stemming from financial reforms like Dodd-Frank and Basel III. Because of these factors, it is likely that the U.S. economy can sustain a much higher debt-to-GDP ratio than it has in past. Much of what one might recommend in terms of optimal policy stems from what is assumed to drive productivity (and population growth). 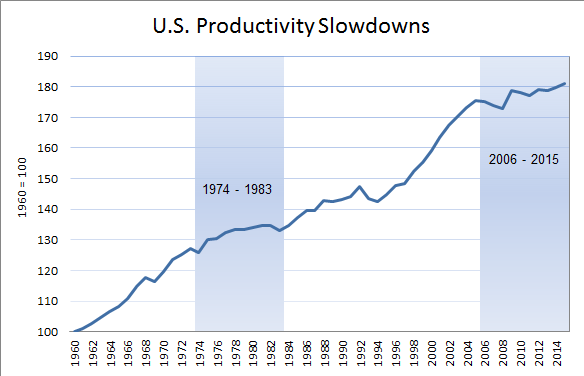 For economies operating below the technological frontier (e.g., EMEs), productivity slowdowns might be avoided, in principle at least, through some type of policy change. However, the case is much less clear (to me) for economies operating near the technological frontier, where the Schumpetrian dynamic is more likely to govern the productivity dynamic. Some may point to the innovations produced during the second world war as example of how expansionary fiscal policy might enhance productivity growth. But surely, basic research and development can be better subsidized in a more targeted manner, without appealing to a massive and broad-based fiscal expenditure. Let's think about what things must have looked like for Hansen in late 1938. Earlier in the decade, the United States suffered a major economic contraction. 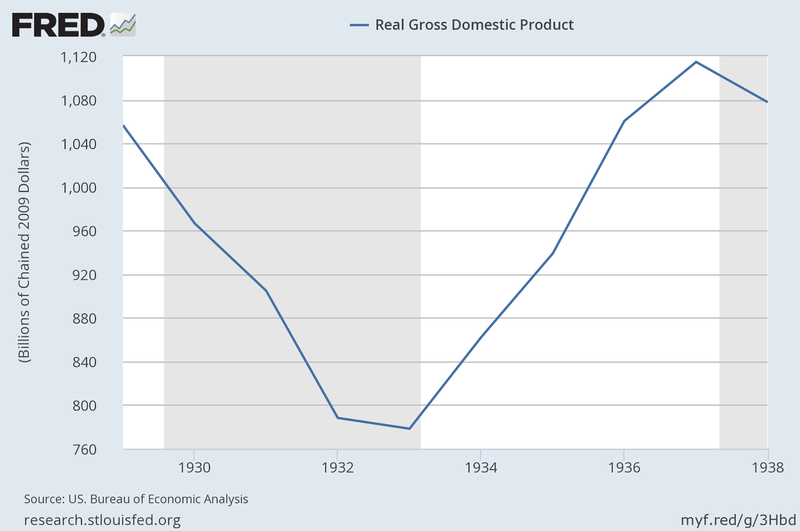 From 1929-1933, real GDP declined by over 25%. 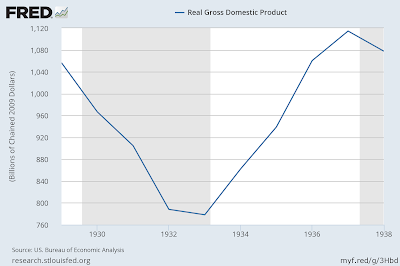 And despite a robust period of growth from 1933-1937, the economy slipped back into recession in 1938. 1938 must have looked disappointing (to say the least) for those living at the time. 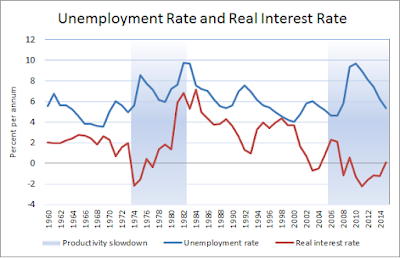 After a decade of economic hardship (the unemployment rate remained elevated throughout the episode) and recovery, the economy's capacity to produce material wealth in 1938 was no greater than its capacity in 1928. Was this the end of growth? So that's roughly the evidence. What about theory? Hansen notes that earlier economists were focused mainly on how economic growth (driven by technological change, population growth, etc.) affected material living standards (the level of real per capita income). Later economists began to notice that growth and economic stability might be related (the central tenant of modern real business cycle theory). But more recently, Hansen writes, "the role of economic progress in the maintenance of full employment of the productive resources has come under consideration." (It is notable that the economists he cites for initiating this line of inquiry includes Wicksell and not Keynes; see David Laidler). 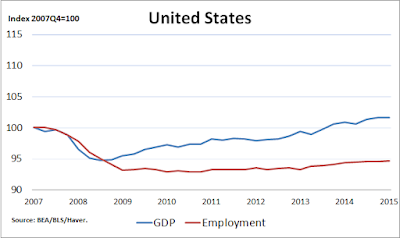 The theory Hansen espouses seems to relate the level of employment (say, as measured by the employment-to-population ratio or the unemployment rate) to the rate of economic growth. The rate of economic growth is determined by technological progress and population growth. Both of these forces are secular in the sense they tend to operate over extended horizons (i.e., over decades and not from quarter-to-quarter or year-to-year). The effect of growth is to elevate the desire for capital expenditure. A larger population stimulates the construction of residential capital. New industries and technologies stimulate the demand for business fixed investment. Workers are needed to build the stuff. Ergo, a higher rate of growth over long periods of time begets a higher rate of resource utilization over the same period of time (higher average employment rate, lower average unemployment rate). For it is an indisputable fact that the prevailing economic system has never been able to reach reasonably full employment or the attainment of its currently realizable real income without making large investment expenditures. I shall not attempt any summary statement of this analysis. Nor is this necessary; for I take it that it is accepted by all schools of current economic thought that full employment and the maximum current attainable income level cannot be reached in the modern free enterprise economy without a volume of investment expenditures adequate to fill the gap between consumption expenditures and that level of income which could be achieved were all the factors employed. So my best guess of what we might have here is a version of Friedman's "plucking model" (with full employment serving as a ceiling or capacity constraint) combined with some classical notion of the difficulty associated with matching the flow of national saving with the flow of national investment. This process evidently does not work well as it should unless the demand for investment is high--which, in turn, is not generally possible unless the economy (technology and/or population) is growing rapidly. While the hypothesis seems similar to Keynes (1936) in that depressed investment is the proximate cause of persistently high unemployment, there is (I think) an important difference. Keynes emphasized the role of "animal spirits" in determining investment demand. Depressed expectations over the "prospective rate of profit on new investment" might become a self-fulfilling prophecy (see Farmer). Although I could be wrong, I don't ever recall Keynes suggesting that the cure for high unemployment was more rapid technological progress. I think of Keynes (1936) as an explanation for depressed levels, unrelated to growth phenomena. Hansen, on the other hand, could be interpreted as holding the view that expectations are more firmly anchored on economic fundamentals ("...we are forced to regard the factors which underlie economic progress as the dominant determinants of investment and employment.") For this reason, Hansen seemed less enamored than Keynes on the use of expansionary fiscal policy to combat high unemployment. After all, if the fundamental problem is low growth, attempts to boost "aggregate demand" can at best confer only transitory benefits. Moreover, these benefits may over time be swamped by cost considerations, like a mounting public debt. Insofar as Hansen (1939) provides policy advice, it sounds not so much like a pro-growth agenda as it does a set of anti-anti-growth recommendations. To paraphrase: "Population growth is fading. There are no new territories to settle and exploit. We can only hope for more technological advancement, so don't do anything to hamper this last great hope of ours. Except that it seems that we are: the growing power of trade unions, trade associations, and other monopolistic practices are restricting technological advance. This is a great folly." Hansen's secular stagnation hypothesis was largely forgotten over time. I'm not entirely sure why this was the case, especially in light of the subsequent popularity of Keynesian theory. Maybe it had something to do with their respective policy recommendations. Active demand management sounds more appealing than dismantling trade unions, I suppose. I sometimes hear people suggest that Hansen's hypothesis fell out of favor because it was proved wrong. Shortly after he wrote, the growth factors took off and the unemployment rate remained low on average. However, Hansen did not exactly offer a prognostication--his theory is better thought of (like any theory) as a conditional forecast. Of first-rate importance is the development of new industries. There is certainly no basis for the assumption that these are a thing of the past. But there is equally no basis for the assumption that we can take it for granted the rapid emergence of new industries rich in investment opportunities as the railroad, or more recently the automobile, together with all the related developments, including the construction of public roads to which it gave rise. Nor is there any basis, either in history or theory, for the assumption that the rise of new industries proceeds inevitably at a uniform pace. The growth of modern industry has not come in terms of millions of small increments of change giving rise to smooth and even development. Characteristically, it has come by gigantic leaps and bounds. He cites D. H. Roberston for this view, but it is also a recurring theme in Schumpeter's work (see my earlier post relating Schumpeterian growth to secular stagnation). So, where does this leave us? No, I don't think Hansen's theory was proved wrong by subsequent developments. That the conditioning factors turned out not to prevail should not be construed as a rejection of the theory. The theory should be evaluated on other grounds. 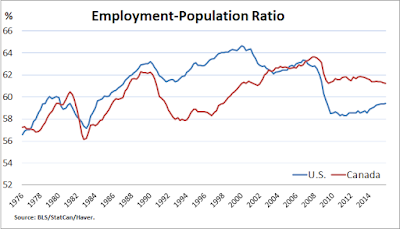 The central proposition is that high growth (via technology and or population) is necessary to keep labor near "full employment" (the level of output near "potential.") In particular, high growth is necessary to stimulate the capital spending that will employ the labor input. I am curious to know what sort of empirical evidence one might bring to bear on this hypothesis. We have a lot more data at our disposal than Hansen. How should this data be organized? Should we estimate a Hamilton regime-switching model on growth rate regimes and correlate estimated growth regime against the average employment-to-population ratio? 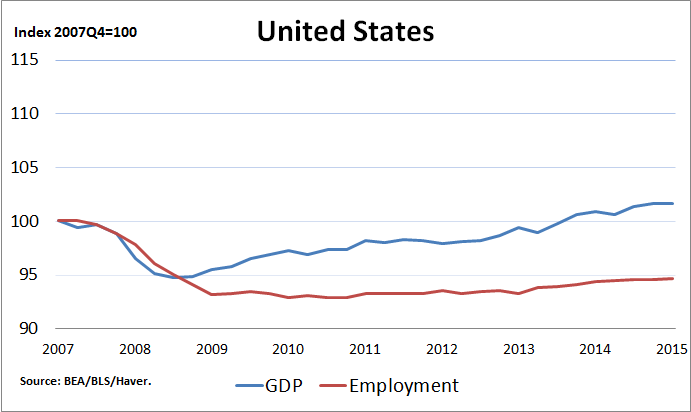 As well, there is the perennial question of how to identify theoretical objects like "full employment" or "potential GDP" in the data. How far such a [stimulative] program, whether financed by taxation or borrowing, can be carried out without adversely affecting the system of free enterprise is a problem with which economists, I predict, will have to wrestle in the future far more intensely than in the past. Well, he certainly got that prediction right! 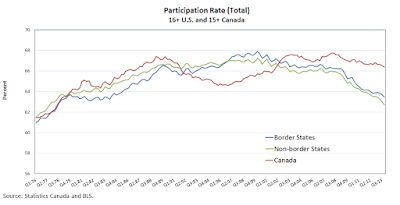 Back in 2010, I asked whether the U.S. might be in for a prolonged economic slump, similar to what Canada experienced in the 1990s (The Great Canadian Slump). It looks like the answer should have been "yes." 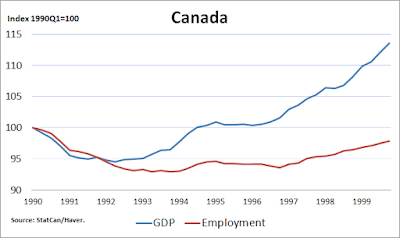 I think this is an interesting comparison because the slump in Canada was not precipitated by a financial crisis. Moreover, there was no "zero lower bound" issue at the time. Unlike in the U.S. today, the yields on Canadian government debt were high, not low. Let's take a look at some data. 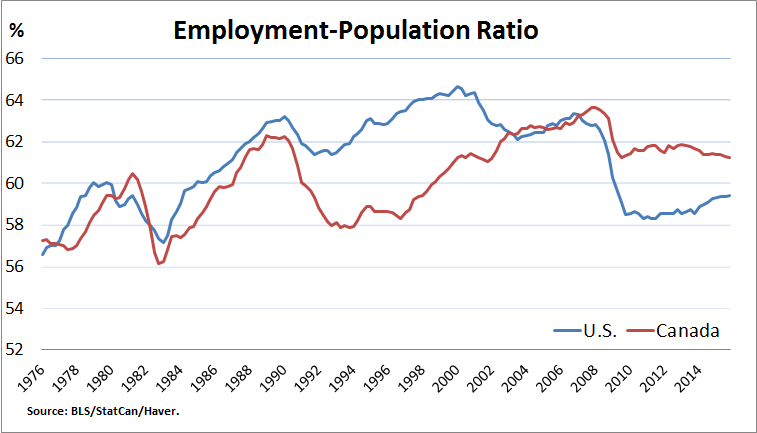 Consider first the employment-population ratio (population of adults), or EPOP for short. 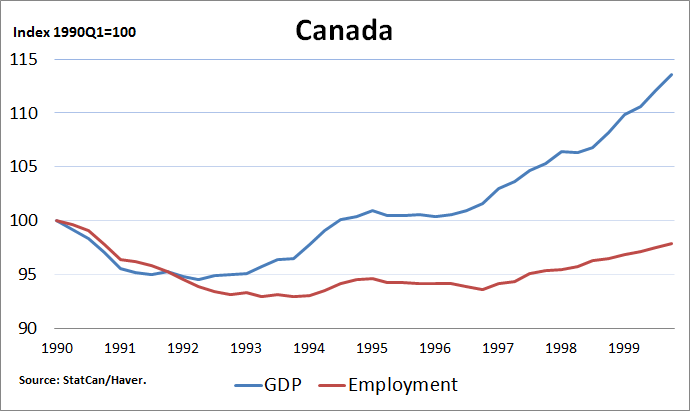 In the early 1990s, employment in Canada dropped very sharply and dramatically. 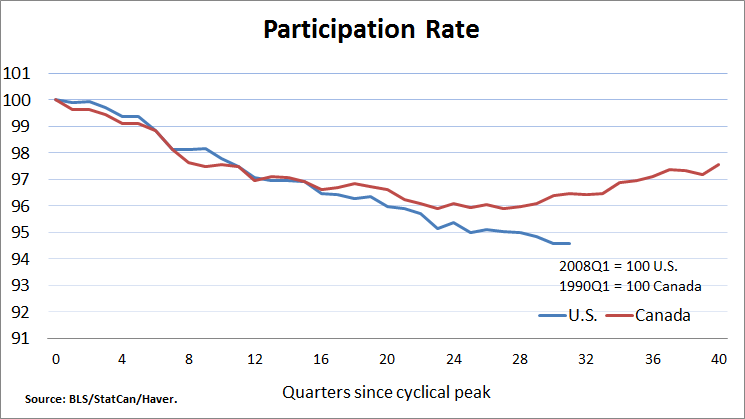 This decline was as severe as the decline in U.S. employment during the great recession. 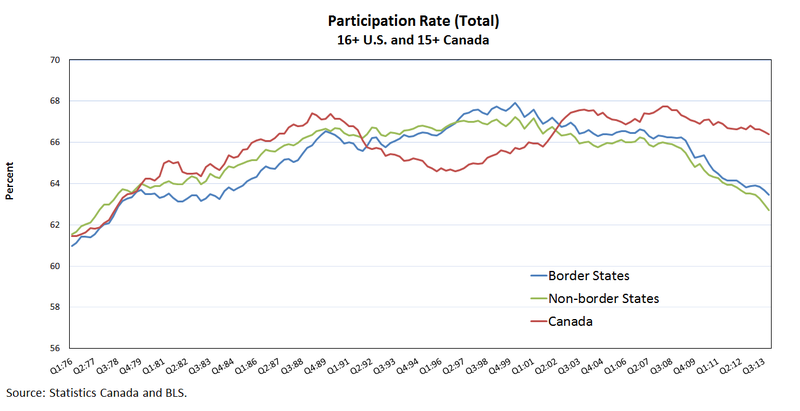 It took roughly a decade for the Canadian EPOP to attain its previous peak. In the Great White North, this episode is called the Great Canadian Slump. The parallel between these two recovery dynamics, for two different countries, at two different times, is really quite remarkable. 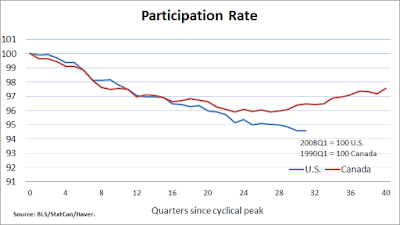 The following diagram normalizes the EPOP to 100 at its cyclical peak (1990Q1 for Canada and 2008Q1 for the U.S.) and then plots the recovery dynamic in each case. 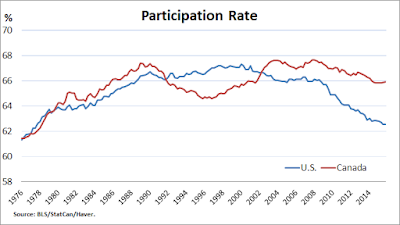 We can repeat the same exercise for the labor-force participation rate (LFPR). 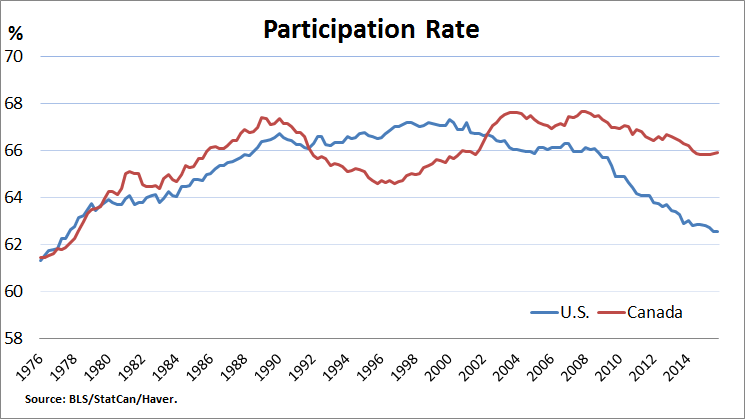 I don't hear too much talk about "jobless recovery" in relation to the U.S. today. The language has shifted to describing this recovery dynamic as "secular stagnation." I'm still not entirely clear what people mean by term "secular stagnation." The phrase was originally coined by Hansen (1939). 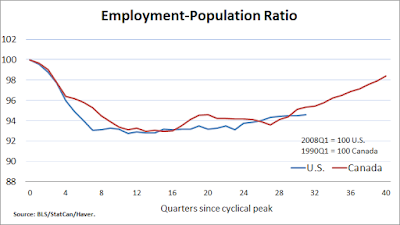 Hansen argued that rapid growth in technology and/or population was necessary to keep the economy at "full employment." 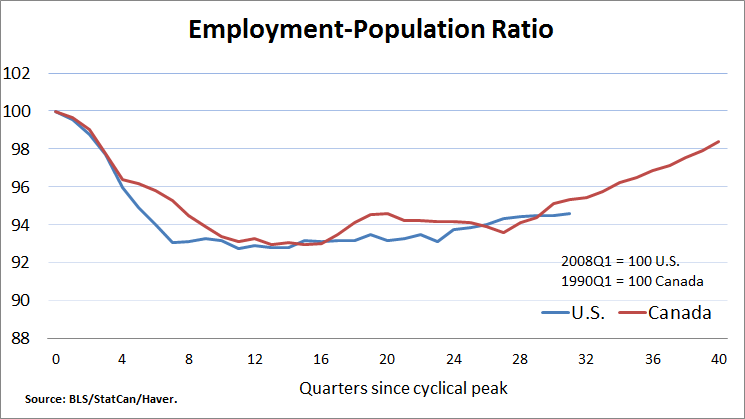 The proposition sounds like a version of Okun's Law, except that the relationship posited seems to be between the level of employment (EPOP) as a function of the growth rate of the economy. Hansen did not have much to say about interest rates, except to remark that they're mainly symptomatic and that economists tend to make too much of them. This view seems somewhat different from the one espoused by Larry Summers, who attaches greater significance to low interest rates--even suggesting that they're a defining characteristic of secular stagnation. Moreover, unlike Hansen, he seems to suggest at times that the direction of causality can be reversed; i.e., that a policy that increases the level EPOP can stimulate GDP growth (both in the short and long run, I presume). This latter proposition sounds a bit like Verdoorn's law. I'll have a bit more to say about all this in a future post.